Laurier alumnus Brad Katsuyama (BBA ’01) is the subject of a cover story in the October 2015 issue of The Globe and Mail’s Report on Business magazine. The story, entitled “Flash forward: A year after Flash Boys made Brad Katsuyama famous, he’s still trying to save Wall Street from itself,” chronicles Katsuyama’s life since being thrust into the spotlight after being the central figure in Flash Boys: A Wall Street Revolt, a controversial book by author Michael Lewis – of Moneyball fame – released in April of 2014. Flash Boys argues that the stock market is rigged due to predatory high-frequency trading (HFT), a practice in which high-speed computers complete trades in microseconds, reacting to changing stock prices before human traders are even aware of them. Katsuyama, who formed his own alternative trading system called IEX Group Inc. in 2013, became the face of this argument and an instant celebrity in the business world, being featured in a segment on 60 Minutes; famously getting into a 23-minute debate with the CEO of BATS Global Markets live on CNBC; and testifying on the threat of predatory HFT before a United States Senate subcommittee. Katsuyama began his career on Wall Street shortly after graduating from Laurier in 2001, working as a trader for the Royal Bank of Canada in New York City. In 2007 he began noticing a problem with the trades he was trying to execute; his orders were being partially filled and he would have to pay a higher price for the rest – he was falling victim to predatory HFT. It wasn’t until 2009, when he began to notice colleagues having the same problems he was having at RBC, that Katsuyama realized predatory HFT posed a systemic problem. 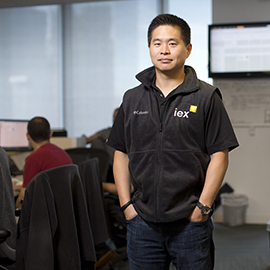 That realization led to Katsuyama and his team at RBC developing a tool to prevent computers from hijacking trades, and eventually the formation of IEX Group, an alternative stock exchange that levels the playing field by preventing high-frequency computers from moving faster than the exchange itself. The Report on Business magazine feature on Katsuyama is available online on The Globe and Mail website (subscription required). Katsuyama was also the subject of a feature story in the Winter 2014 edition of Laurier Campus magazine.